SHOW ROOM: War-time relics, swords and antlers are among the many items making up the eclectic display. Who knew Japanese martial arts had such a fascinating origin story? Look no further than the National Museum of Jamaica’s new exhibition, The Spirit of Budo, which offers compelling proof of that Asian country’s enormous and enduring contribution to the world of combat and martial arts, war strategies and techniques. It’s a travelling exhibition (under the auspices of The Japan Foundation), which comes to Jamaica after an eventful sojourn overseas, bringing a visual feast that truly transports you to another world, an oriental realm mired in rich history and the spirit of struggle and survival. But there’s another way to consider this lavish showcase spread across multiple adjoining rooms: as a history lesson that will excite not only students and their teachers but anyone who’s ever wanted to learn more about this aspect of Japan’s multi-layered culture. The viewer is treated to an eclectic assortment of forms and media (pictorial, animé, artefacts, vintage posters, information placards, video installations and even feature film) that create a spellbinding whole. Still, the display’s high notes are undoubtedly those war-time relics, well-preserved (some reimagined) and put on view in exquisite glass cases. Highlights include a series of han-dachi swords, kawai kabuto stag antlers, gunpowder cases, a surplus of bows and arrows, helmets and training items, including weights for the muscles and clogs for the feet. In this well-lit exhibition space, you sometimes feel as though you’re inside an international military museum taking in the numerous sights and sounds. But at its core, this exhibition has more to do with Japan’s singular and storied history that anything else. Fans of judo, kendo, karate and samurai folklore will certainly enjoy the video demonstrations and animé clips, not to mention, the footage depicting native Japanese schoolchildren and adults (amateurs and pros alike) learning the ropes and showing off their skills. 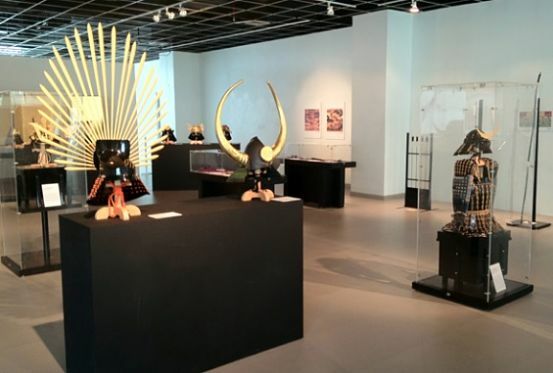 The Spirit of Budo: The History of Japan’s Martial Arts will be on view at the National Museum of Jamaica, 10-16 East Street (Downtown Kingston), until March 18.